James Robert Cade was born in San Antonio, Texas. After High School his mother gave him the choice of either college or the service. He joined the Navy and became a pharmacist’s mate. After the Navy he not only went to college but graduated from Medical School. 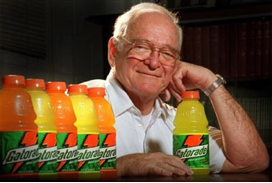 Widely known as the inventor of Gatorade, this 1965 invention used the University of Florida Gator Football Team as research subjects. The purpose of Gatorade was to replenish fluids and electrolytes lost to sweat during intense activity. This singular invention launched the sports drink industry. Dr. Cade was a modern renaissance man. He was a researcher, a physician, a musician, and restorer of old automobiles. Cade was also known for his collection of vintage Studebakers. But more than Gatorade, medicine or vintage autos, Dr. Cade was widely known for his generosity, from supplying rowing boats to funding medical school students. He even needed to borrow money to pay his own taxes because he had given others so much. His family continues his legacy and is planning the Cade Museum for Creativity and Invention.